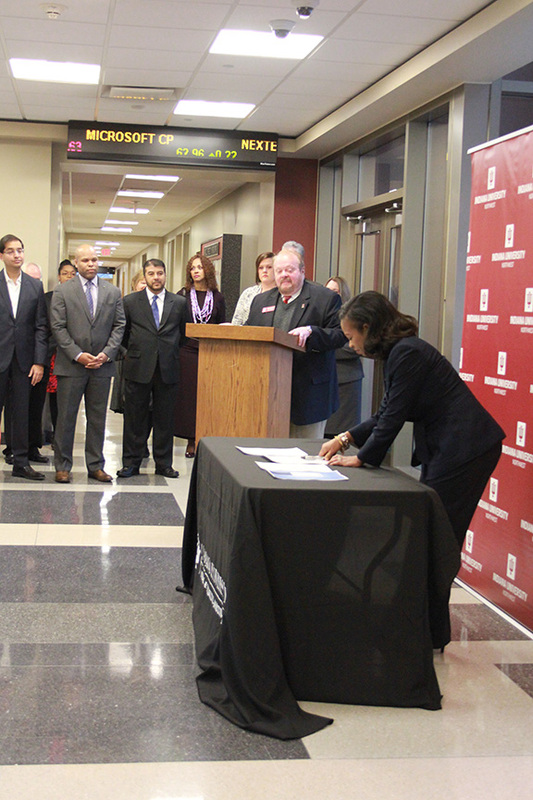 Dr. Janet Seabrook signs a letter of intent on behalf of Community HealthNet Health Centers, becoming one of nine partners that will form the Northwest Indiana Graduate Medical Education Consortium. Health care leaders and medical students gather for the signing of a letter of intent to form the Northwest Indiana Graduate Medical Education Consortium. 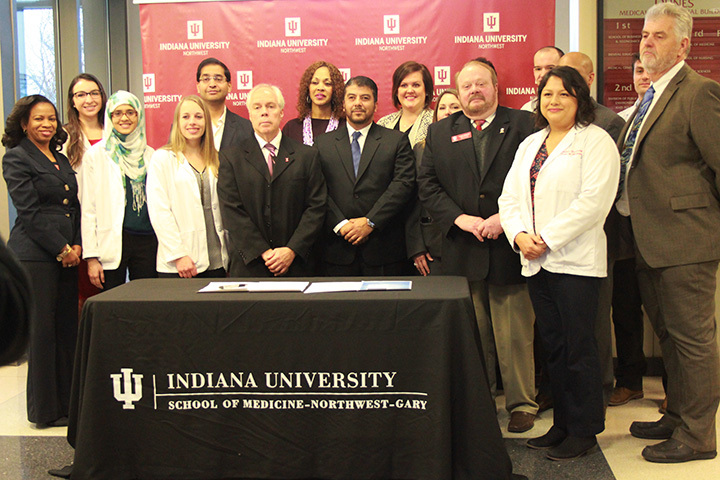 Leaders from nine Northwest Indiana health care institutions gathered at Indiana University School of Medicine - Northwest - Gary (IUSM-NW-G) on Tuesday, Jan. 24 to sign a formal letter of intent leading to the creation of the Northwest Indiana Graduate Medical Education Consortium. The signatures represent a promise from leading health care providers in the region to create and apply for residency positions in their organizations. Also, the consortium can apply for newly created state startup funding for those positions, a milestone that IUSM-NW-G Associate Dean and Director Patrick Bankston, Ph.D. expects to see happen sometime this spring. Residency training for future doctors based at local hospitals, community health centers and mental health agencies will be a first for Northwest Indiana, Bankston said. Studies have shown that most often, doctors end up practicing in the same area where they complete their residency training. Providing students with that option is a major step in combating the local physician shortage. The Class of 2019 will likely be the first class to be able to apply for those residencies, expected to number roughly 165 in the first couple of years. A handful of those students were on hand at the ceremonial signing. Choudhry earned her undergraduate degree from IU Northwest and then went directly to IUSM-NW-G for medical school. She is going to be completing her 3rd and 4th year rotations in Northwest Indiana, too. The prospect of landing a residency locally is exciting, she says, because it will be the best preparation for what she wants to do—primary care for the medically underserved in Northwest Indiana. “Training here would help me achieve that and also help me be more involved in the community,” she said. “I'd become more familiar with the (various populations) of Northwest Indiana specifically and it'll better help me meet the needs of my future patients when I work here as a physician after residency. Partners with IUSM-NW-G in the Northwest Indiana Graduate Medical Education Consortium include: The Community Healthcare System (Munster Community, St. Catherine Hospital, St. Mary Medical Center); Methodist Hospitals; Porter Health Care System; and La Porte Hospital; as well as federally qualified health centers (FQHCs) and mental health centers, including: Community HealthNet Health Centers, HealthLinc, Inc.; Regional Mental Health Center; Porter-Starke Services; and Edgewater Systems. Rocco Schiralli is chief executive officer of Porter-Starke Services, which operates a community mental health center and the federally qualified Marram Health Center. He noted a particular physician shortage in the field of psychiatry. The NWI GME Consortium will be the second in the state where a regional cooperative approach is being planned; the other is in Southwest Indiana with four regional hospitals participating. Both consortia are planning to apply for state startup funds made available in the last legislative session for the development of increased residencies. If past growth is any indication of the future of medical education in Northwest Indiana, Bankston certainly can be encouraged by the story of IUSM-NW-G.
“The Northwest campus's medical school was born in 1972 with four students and four faculty members and offering only the first year of medical school at the Gary campus,” he said. “In the 1980s, we moved to offering the second year of medical school with about a dozen faculty members. Now we have the third and fourth years of medical school with 32 students in the entering class. Now it looks like we are moving toward the ability to provide residency training and that will complete the full picture of medical education possibilities in Northwest Indiana.